Tour dates have officially been revealed for the 2015 Metal Alliance Tour. 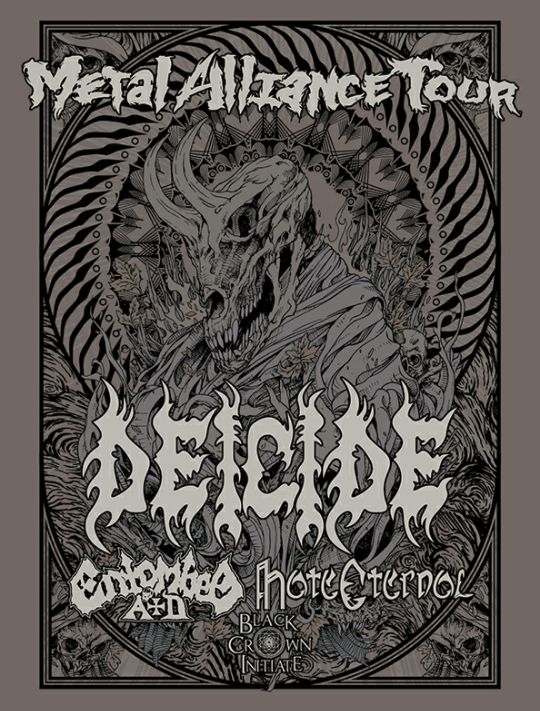 As previously announced, this year’s lineup will include: Deicide, Entombed A.D., Hate Eternal and Black Crown Initiate. 06/05 Spokane, WA – The Pin! 06/16 Dallas, TX – Gas Monkey Live! Shattered Sun have premiered a lyric video for their new song, “The Ultimatum,” via Loudwire. This song is from the band’s new album, Hope Within Hatred, which will be released on April 21. Stone Sour have posted a preview for their cover of Alice In Chains’ “We Die Young.” This cover will be featured on the band’s new covers EP, Meanwhile In Burbank…, which will be released on Record Store Day (April 18). Weezer, Panic! At The Disco, All Time Low, New Found Glory (feat. Hayley Williams of Paramore), Taking Back Sunday, Simple Plan, Halestorm, Black Veil Brides, Echosmith, Sum 41, Motionless In White and Madden Brothers. Their will also be ‘Vanguard’ and ‘Icon’ awards, as well, but these will not be fan-voted. The polls are open for all the other categories at Alternative Press’ site. Agnostic Front are streaming their new album, The American Dream Died, in its entirety, via Metal Hammer. The album will officially be released on April 7. Killswitch Engage have premiered a new live video, for their song “No End In Sight.” The footage is from the band’s upcoming DVD, which was filmed at their Halloween show in Worcester, MA, last year.